July 9—Altus Press is proud to announce the publication of the most important collection of Sax Rohmer’s work in decades. 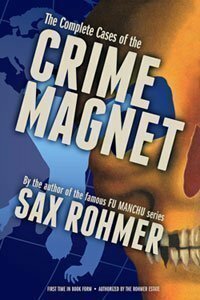 Eighteen months in the making, July will see the release of The Complete Cases of the Crime Magnet, fully authorized by the Rohmer estate. Best known for his thrilling tales of Dr. Fu Manchu, author Sax Rohmer also penned the adventures of the resourceful Major Bernard de Treville, known better as “The Crime Magnet,” a roving adventurer who encounters intrigue in every corner of the globe. With his companion, Digger, he follows in the footsteps of Sherlock Holmes and Dr. Watson. Originally published in This Week magazine between 1937 to 1945, only a handful of these rare tales have ever been reprinted. Here, for the first time, are all fifteen short stories, plus the exciting serial, “The Panama Plot.” Accompanied by an all-new introduction by Will Murray, historian of popular literature, this is the most significant Sax Rohmer collection in decades. Clocking in at 266 pages, it will be available in hardcover, softcover, and e-book editions. It will be available for sale around July 16. How’s it going? Glad to see the new books rolling out. I thought I’d share a bit of info that might interest you. I’m the editor of a new magazine called ‘Contrappasso’ with a particular emphasis on hardboiled/crime writing. It’s available in print-on-demand and e-book form, and much of the material is also appearing online at our website in the coming weeks. Hey, that looks cool! I’ll have to dig into it soon.